Occasionally people leave us donations when they pass away. Please see their details below. IROKO Theatre Company are very grateful and proud to be the recipient of the Audrey Heavens Memorial Donation. Audrey supported Africa during her lifetime and we are honoured to be chosen to further her memory and legacy. 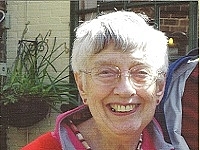 Thank you so much Audrey for your inspirational work, and thanks too to everyone who sent us their donation in her memory. could send donations. Then a friend mentioned you at Iroko and, thankfully, that piece of the puzzle fell into place. 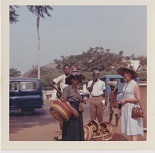 Two of the main themes that ran through mum’s life were art and her relationship with Africa. You could say her early life was taken up in an artistic relationship with parts of Africa – with Nigeria in particular then, to a lesser extent, with Kenya and Egypt as we moved around the continent. Mum grew up in Catford and Bromley in southeast London during the war and went on to study sculpture at The Royal College of Art. She met a Nigerian student and they had a baby, my sister Ollie. After graduating, mum went out to Nigeria to teach art and craft at Queen’s College, Yaba, a year after the country's independence. She became a member of the “Society for Education Through Art” which, according to her CV, set out to inaugurate a Nigerian society with similar aims”. In the following years, she buzzed around the countryside in a Volkswagen Beetle as the Biafran War raged in the background, all the while taking her girls through to their West African Higher School Certificate. While she was in Lagos – painting sets for plays, designing glove puppets for state TV children’s shows and working on a mural and a Coat of Arms at the city library – she met my dad and went on to have me and my sister Catherine. Dad worked for Barclays Bank and we followed him around on his postings, on to Nairobi, then Cairo, then Riyadh, then Hong Kong and finally, back to Lagos. 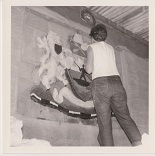 All the time she was making sculptures, sketching street scenes and painting stage sets. So that is why it made sense to approach you. We have been in a bit of a daze, but we all came together for her beautiful funeral in Rochester. We take a lot of comfort from the fact that part of her life is echoed in the work that you are doing now. So, many thanks for that." Depicts the mural Mum painted in the children’s library, in the same City Library as the above mentioned Coat of Arms, in three parts.